Dr. Prince attended veterinary school at The Ohio State University. Following graduation, she completed a small animal internship at Alameda East Veterinary Hospital (home of "ER Vets" on Animal Planet) in Denver, Colorado. She then moved to Great Falls, Montana and practiced veterinary medicine for 4 years before moving to Kalamazoo, Michigan. Dr. Prince initially practiced as an independent contractor in Kalamazoo prior to opening her own practice in 2009. Dr. Prince is an active resident of the Texas Township Community. She participates in the community by performing weekly vet rounds at Kalamazoo County Animal Control & providing services (spays/neuters/exams/etc.) to the local rescue group, Animal Rescue Project. She also serves as a board member for the Southwest Michigan Veterinary Medical Association. Her family includes her husband Chris Smith (an ENT physician), son Hunter and daughter Olivia. Her furry family members include her cat Bezoar and her two dogs, Gracie and Tess. In her spare time, she is an avid runner, skier, and enjoys exercising and training with her dogs. Dr. Prince is very passionate about nurturing the human-animal bond and client education. Every aspect of veterinary medicine intrigues her (dermatology, ophthalmology, internal medicine, behavior). 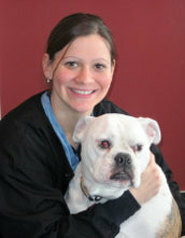 She stays current in all areas of veterinary medicine by attending continuing education conferences. Dr. Billings received her Doctor of Veterinary Medicine at Michigan State University. She then completed an equine internship at the Virginia Maryland Regional College of Veterinary Medicine in Blacksburg, Virginia. Following this, Dr. Billings entered small animal practice in Pittsburgh, Pennsylvania. Professionally, Dr. Billings is very interested in the human-animal bond and general wellness through all life stages. Dr. Billings also enjoys dentistry. After several years away from the Midwest, Dr. Billings and her husband decided to return to Michigan and joined the Kalamazoo community. In her free time, Dr. Billings enjoys playing ice hockey, hiking, and horseback riding. The Billings family has one fur child, a six year old Australian Shepherd named Becker who keeps Dr. Billings active no matter the conditions outside. Kari graduated from Grand Valley State University completed her continuing education at Purdue University at the Animal Behavior Clinic. She has been working in the veterinary field for over 18 years. Her special interest is in canine and feline behavior and human education. She combines these two passions to offer great service to her clients. Kari's training philosophy and techniques are based upon the most up to date scientific learning theory and exclusively use positive-reinforcement. She offers group training classes as well as in-home individualized training. She is certified through the Certification Council of Professional Dog Trainers CCPDT). When Kari is not working she enjoys spending time with her husband and her 3 sons and her 3 "furry" family members - her dogs Lyla, Tico, and Iris. ​Brooke graduated from Bel-Rea Institute of Animal Technology in 2005. She grew up in Michigan's Upper Peninsula! After graduating, she moved to Indiana where she met and married her husband. She moved back to Michigan in 2014. Like any true Yooper, she loves spending time outdoors. She lives on a 22 acre farm where she raises goats, chickens and ducks. She also has horses and a couple cats and dogs. Her favorite part of her job is being an advocate for each patient. She loves helping owners to better care for their furry family members. ​Jesse graduated from Baker College of Flint in 2005. She has experience working in standard animal hospitals as well as emergency medicine. In her free time Jesse enjoys spending time with her husband Mike and two kids Adrian and Efa. They have a vegetable garden and six chickens who they love dearly. Their family would not be complete without their 2 dogs, Jewels and Pan, and their cat Starfish.